The Omni Broker Package is a totally integrated software system designed specifically for broker and logistics operations. The system includes the ability to assign Truckload, LTL and consolidated LTL manifests to carriers. Carriers can be paid by flat rates, percentage or mileage. For dedicated or carrier management operations, the system can autorate pay calculations for carriers and find the least expensive rates. There are limitless searches available for carriers, including carrier name, MC#, phone number, City, State and historical trip detail. Build rate tables specific to each customer. Multiple function screen for assigning loads to carriers. 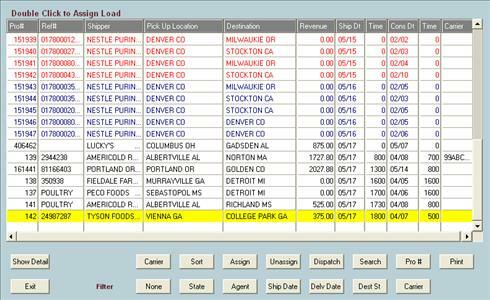 The Load Assignment screen allows for complete planning, assignment and dispatch of carriers to loads. The dispatcher can perform dispatch duties while allowing immediate access to pertinent operational information. The ability to view all information relevant to the loads and carriers in one screen provides dispatch with information to quickly make cost effective decisions on carrier assignment. This means fewer lost opportunities and faster, more effective decisions, which ultimately delivers you a faster path to profit and productivity. Search for carriers by ANY user defined criteria (i.e. load type, destination, etc) while assigning loads to carriers. Easily locate carriers by searching on information that you define based on how you do business. Providing quick access to information means a faster and more effective process which translates to a faster path to profit and productivity. Automatically updates pay data in settlements for carriers from the rate agreement. The system handles settlement pay calculations for each load based on rate agreement. Accurately retaining information relating to each load results in better revenue reports used for management decisions and accurate pay for carriers; ultimately, reducing the cost associated with processing carrier pay. The Omni system retains a complete tracking of loads from origin to destination and automatically records historical dispatch status information. View all loads in transit by state, region or multiple regions showing current load status, carrier and ETA. The ability to research information about customer deliveries reduces internal administration costs associated with bill processing and auditing while providing better customer service. Make daily notes for carriers, loads and customers in a memo note that can be retrieved, viewed and updated at any time throughout the system, providing the user with a tool to record conversations, plans or reminders. This means fewer lost opportunities and faster, more effective decisions. Booking Sheet and Rate Agreement on request. Print or email booking sheet and carrier rate agreement at any time, thus reducing the administrative time associated with carrier load assignments. Complete payment history to carriers. Easily view prior pay history for carriers by origin / destination while assigning loads to carriers. Select the most cost effective carriers for a specific lane based on payment history . Providing quick access to information means a faster and more effective process which translates to a faster path to profit and productivity. Carrier file includes required insurance information, MC number, contact, fax #, email address, comments, third party payment and more. The carrier file is a one time setup of all carrier information that will be used throughout the system. This minimizes data entry time by eliminating the need to enter the information each time which creates improved performance for the user. Dispatchers can easily view, print or email any scanned documents to a customer. The Omni system provides the ability to scan and save images of bills of lading, delivery receipts or any other relevant backup documentation related to loads. Users can easily query the loads to view, print or email any backup to a customer. In addition scanned images can be attached to Carriers and Customers for easy access. Send the current Pro status to the Payor for a load with one click. Status updates are available when the Pro is booked, dispatched, and when any status change is made on the loads in transit including delivery status. Information on the email includes Pro #, Reference #, PO #, origin, destination, pieces, weight and current status. Pay your Carriers by any method: % of revenue, mileage, flat rate, hundred weight, # of cases, stop offs and exception pay. On-site training, web training and training at our training center in Atlanta. Training can be totally customized to your budget and needs. Move towards a paperless work place. With Omni, you can print to a PDF file from the Omni print screen window and save the printouts on your server for future reference. Use the Omni email functions to email reports and images created by Omni directly to a third party. Email invoices to customers and settlements to Carriers. Email load status updates to Payor with just one click.